Toronto's Hare Krishna Community Welcomes Atmarama das! ~ The Toronto Hare Krishna Temple! Toronto's Hare Krishna Community Welcomes Atmarama das! Toronto's Hare Krishna temple is excited to announce that HG Atmarama das will be joining us for our weekly Sunday Feast tomorrow. HG Atmarama Dasa, devotional singer and composer of sacred music, has become known for his power to transmit bhakti - spiritual devotion and shakti - divine energy. For the past 25 years he has been residing in India, in the sacred place of Vrindavan, India. 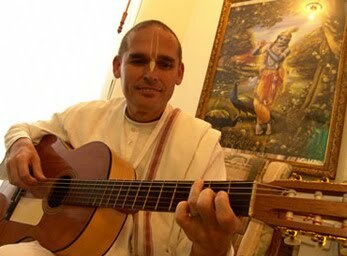 While living in Vrindavan absorbed in spiritual life, his devotion deepened and in turn, his musical ability blossomed. After spending several years there engaged in devotional service and Vedic studies; he developed a strong desire to share the nectar of Vrindavan with others. An event with Atmarama prabhu is one full of devotion incorporating timeless wisdom with divine Sanskrit chants and bhajans. His soaring, tenor voice sings from the Bhagavad Gita, Upanishads, and the Brahma Samhita as he plays the flamenco guitar combined with Indian raga. His unique style and sincere desire to share his spiritual understanding creates an atmosphere of profound spiritual vibration. He concludes with an ecstatic kirtan through which everyone can relish the mood of transcendental joy and bliss. We warmly invite everyone to come to tomorrow's special Sunday Feast, featuring Atmarama das!